Collecting Antique Clocks: The oldest surviving clock by a Welsh clockmaker? Collecting Antique Clocks The oldest surviving clock by a Welsh clockmaker? A most unusual wall clock came to light recently, by a maker not to be found in the reference books - one Thomas Banister of Norton. The nine-inch square dial is like that of a single-handed longcase clock, but set on one corner point, to make what in heraldry they call a 'lozenge' shape. Church clocks often had their dials in this shape, but in domestic clocks it is exceptionally unusual - perhaps because it would be awkward to make a case with a lozenge-shaped hood. The maker's signature is set astride the VI numeral as usual, and at first sight this dial gives the impression that the chapter ring has been put on to the dial sheet one notch out of register. This is the sort of thing some meddler might do, who took the clock apart and put it back again wrongly. A chapter ring usually has four possible fixing positions. Setting an incorrectly-positioned chapter ring back correctly might make this clock sit flat on its dial base, as others do. But in fact on examining the back of this dial, it is obvious that the dial was intended to sit on its point. 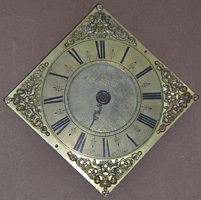 The movement is vertical to the base point, and the clock could not have worked if the dial were set up in any other way. The clock had to be a lozenge-shaped wall clock, intended to sit on a shelf. It had clearly lain disused for some years, its shelf long lost, drive weight and chain missing. The movement is a timepiece - that is the technical term for a clock which does not strike. It has a verge escapement with short pendulum, an unusual feature, which makes such a clock much more interesting to a collector than a conventional anchor escapement with long pendulum. In fact the pendulum is broken short, the lower section missing, but its full length would be about five or six inches. So this clock is a verge escapement wall clock, not in itself a great rarity, but something we don't encounter every day of the week. Certainly a lozenge-shaped example is very rare. I've only ever seen three or four with a dial of this shape, and never actually been able to play with one before. More interesting still, the movement is really tiny, as such things go. It measures about five inches tall by two inches wide by one and a half inches deep. All the more delightful for a collector. But how old and by whom? The style of the dial tells us everything, and every feature on that dial suggested to me late seventeenth or very early eighteenth century. The hand is a single hand, an hour hand of course, which indicates hours, half hours and quarter hours, as they all do. But the style of this hand with its straight pointer is much more like that of a conventional minute hand of that period. We do see such hands, but rarely, and we suppose they were very occasionally made that way to attempt precise indication on a small dial - something not so easily done with the usual bulbous hour hand in its typical ace-of-spades shape. 1. The nine-inch lozenge-shaped dial of the extraordinary verge wall clock by Thomas Banister of Norton, c.1690-c.1700. Click for closer view. What about the maker? The name Thomas Ban(n)ister is barely known in clockmaking at this early period. One n or two usually makes little difference, as spelling at this time was rarely consistent, even when a person wrote down his own name. They say William Shakespeare signed his own name with I think it was fifteen different spellings - but perhaps some of them were by Marlowe! There is a record of a clockmaker called Thomas Banister working at Weobley in Herefordshire in the early eighteenth century, though we know no facts about his life, just a record of an occasional clock signed this way. Another man of this name made clocks at Brecon in Wales, some twenty or thirty miles west of Weobley, from at least 1712, when the first of his seven children was baptised, till his death there in 1737. Could this clock made by either of these men or by someone quite different? At least the dates were about right. .. I began the search half-heartedly. The only chance of picking up the name of such a clockmaker is if you happen to hit upon records in the parish registers of his marriage or the baptisms of his children, and that's a bit of a slim chance. A bachelor, for instance, would have left no trace of his presence there. But as luck would have it, I eventually chanced upon the right Norton, which was in fact Norton Canon, just a few miles west of Hereford, and only about two miles south-west of Weobley. There was a Thomas Banister who had several children baptised there by his wife, Elizabeth, in the years between 1690 and 1704. Further searching uncovered the marriage of his son, Thomas, nearby in 1739, and the insolvency of a clockmaker named Henry Banister at Weobley in 1737 - surely the same Henry as Thomas's son, who was baptised at Norton in 1700. This had to be the clockmaker, though the trade of the man is rarely specified in the early parish registers. It was clear that Thomas lived in the parish of Norton Canon, a village with only 72 houses and a population of 282 according to the 1801 census. Not surprisingly he can have made few clocks when working there (perhaps for as little as fourteen years), which probably accounts for the reason he has not been recorded previously in the clock reference books. But we know from those same books that some of his clocks were signed at Weobley, a much busier little town with 158 houses and a bursting population of 608! Was Thomas hoping to make a livelihood selling clocks to a population of less than one thousand people? Of course not. Far more important was the fact that Weobley had a weekly market every Thursday and lay on the main road from Hereford to Knighton. Every passing traveller from miles around would be up and down this road by foot, horse and by carriage for market day and other journeyings. It was on such main thorofares that blacksmiths, clocksmiths and clockmakers had spread their nets since time began, as every passing person might be in need of some sort of mechanical repair - from a horse shoe, to a cart wheel, to a broken pair of spectacles. At this early period it is safe to say that all country clockmakers were multi-skilled workers in metal, and most clockmakers spent most of their time not in making clocks, but in mending almost anything made of metal. 2. The movement of the Banister wall clock showing its verge escapement and the stump of the broken pendulum. Click for closer view. The appearance of a clockmaker of this same name at Brecon, twenty-six miles to the south-west, by 1712, cannot be chance. It must be this same Thomas who moved for a greater share of the larger town market. It happened with many rural makers, who gradually concentrated more on clocks than on other whitesmith work, that they removed to a more populous town where they could hope to specialise more in their preferred aspect of the craft. The Brecon maker had seven more children baptised there (possibly born to a second wife) from 1712 onwards, which means he moved there some time between 1704 and 1712. He died there in 1737. How very odd that 1737 was the very year in which clockmaker Henry Banister of Weobley, presumably Thomas's son, went bankrupt. Could it be that certain debts of his father's had to be paid out at his death, or certain bequests he made fell due at a particularly awkward time for the son? As is typical with this kind of research, every answer leads to even more interesting questions, and the quest is never finished. There is more to be found out yet, and the search goes on. But meantime at least we know more about the maker of this unusual clock. Another interesting point is worth making. According to William Linnard's recently published book 'Wales - Clocks & Clockmakers', the oldest surviving household clock made in Wales is believed to be a longcase clock, now in fact in Australia, by Richard Joynson of Wrexham, who worked there from at least 1701 till he died in 1711. Thomas Banister of Brecon is certainly counted as a Welsh clockmaker - even though, dare we say it, he was originally an Englishman. Now this newly-discovered clock by Thomas Banister must pre-date 1704, and could well be a contender for this title. If not the oldest surviving clock made in Wales, it is probably the oldest surviving clock made by a Welsh clockmaker - though made when he was still an Englishman!